Champion race driver Colin Bond got reacquainted with the car that was part of Australian motorsport’s most famous moment at the Armor All Gold Coast 600 at Surfers Paradise today. 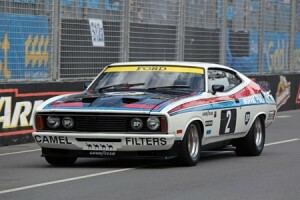 For only the second time since 1977, Bond drove the #2 Ford Falcon XC that finished second in the Bathurst 1000 33 years ago behind team-mate Allan Moffat – a moment that will be re-enacted on Sunday. 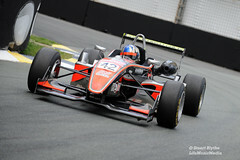 Bond, along with 10 other Australian motor racing heroes, drove at the Surfers Paradise circuit in the first of three demonstration race sessions for the popular Pirtek Australian Legends category. The first day of the Nikon Indy 300 has got off to a flying start on the Streets of Surfers Paradise today. The IndyCar Series team of Newman/Haas/Lanigan Racing have prepared for their first appearance on track on Friday in a unique way, taking part in a two-part activity with the Australian Defence Force yesterday and today. Wednesday afternoon saw NHLR drivers Justin Wilson and Graham Rahal, along with 20 of their crew, head to the launch pad with the Army Aviation Brigade for a flight aboard two Black Hawk Helicopters over the Gold Coast. Captain Nick Kelly flew the Black Hawk with co-pilot Captain Greg Smalley to give Wilson and Rahal an entirely different perspective of the Surfers Paradise coastline, including a birds-eye view of the Nikon Indy 300 circuit. “It was a great experience to be able to view the track from a totally different angle, to fly around the buildings and look down at the track was awesome and its another great memory I will always have from Surfers Paradise,” said Rahal. To return the favour extended to them by the Army Aviation troopers, the team opened its garage to them in SEEK Pit Lane today to allow them to get up close and personal with Wilson’s Honda/Dallara/Firestone in the garage with some even having the chance to sit in the car while others checked out Rahal’s machine in pit lane.